Deviled eggs are popular party food for good reason: they’re inexpensive and really easy to make ahead of time, plus they look great on a buffet. 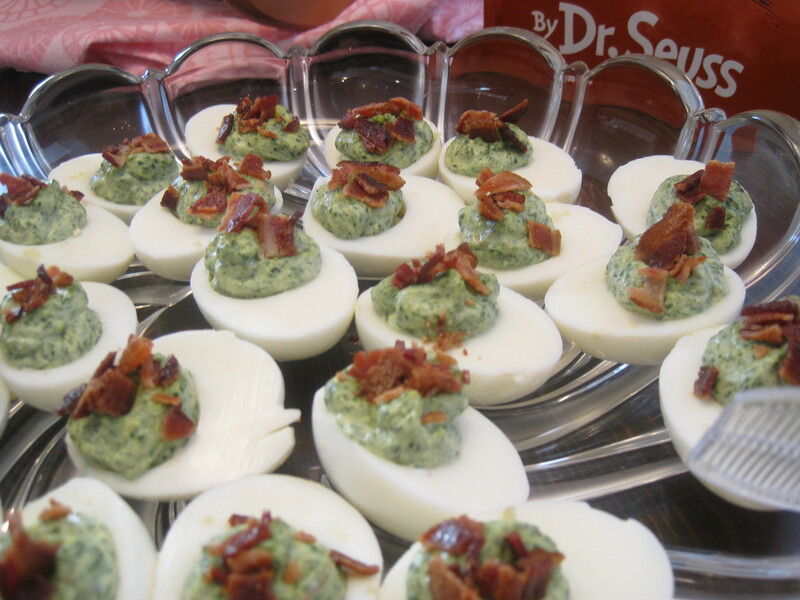 I developed this deviled egg recipe for my sister Beth’s book-themed baby shower, adapting the classic recipe in homage to Dr. Seuss’ Green Eggs and Ham. In developing the recipe, I drew heavily from Rachel Ray’s Green Eggs and Ham scrambled eggs, and Martha Stewart’s Spinach Deviled Eggs. In my recipe, sauteed, pureed spinach gives the yolk filling a greenish hue, and bits of bacon add flavor and garnish the dish. I also took care to use gluten free condiments and bacon so that the dish would be safe for all of our guests to eat. A day ahead of the rest of the prep, hard cook the eggs. Place 12 eggs in a single layer in large saucepan and cover with two inches of tap water. Cook over medium high heat until the water comes to a boil. Once the water boils, remove pan from heat, cover, and let sit covered for 12 minutes. After 12 minutes, gently add a few cups of ice to the pan, repeating as necessary until the water is cold. Remove cooled eggs from the pan and pat dry. Store in a closed container in the fridge for up to a week. Peel the eggs. Slice them in half lengthwise, then remove the yolks and set them aside in a small mixing bowl. Wash and dry the spinach. Heat olive oil in a large saute pan over medium heat. Add the spinach and cook, tossing occasionally, until the greens are completely wilted and start to look a bit dry. Transfer cooked greens to paper towels and squeeze out any extra moisture. Next, cook the bacon in the saute pan. Drain crispy cooked bacon on paper towels to remove any extra grease. Once bacon cools, crumble/chop it into fine pieces. Set aside. Combine cooked, drained spinach with mayonnaise and mustard in a food processor. Puree until mixture is well combined and tinted green. Add egg yolks and pulse until yolk mixture is smooth. Add salt, pepper, and paprika to taste, pulsing until well combined. Pulse in half the crumbled bacon to the yolk mixture. Transfer filling to a heavy-duty plastic sandwich bag. Arrange egg white halves on a serving platter. Snip off one bottom corner of the sandwich bag and pipe filling into each egg-half. Garnish finished eggs with remaining crumbled bacon. *Hint: if you’re preparing the deviled eggs to take to a party at someone else’s home, you’ll need an egg plate to transport the finished eggs safely. I don’t have –or want– an egg plate, so I just used ziploc bags to transport the component parts of this recipe to the party and assembled them on-site on a regular serving plate. This is a great way to store the eggs, too, since the separate parts will stay fresher longer than the assembled eggs. A gallon-sized bag will hold the peeled, halved egg whites. A snack-sized bag will hold the crumbled bacon garnish. And a sandwich-sized bag will hold the filling. Obviously, you should wait to snip the corner of the filling bag to pipe the filling until you arrive at the destination and are ready to set up the eggs for service. 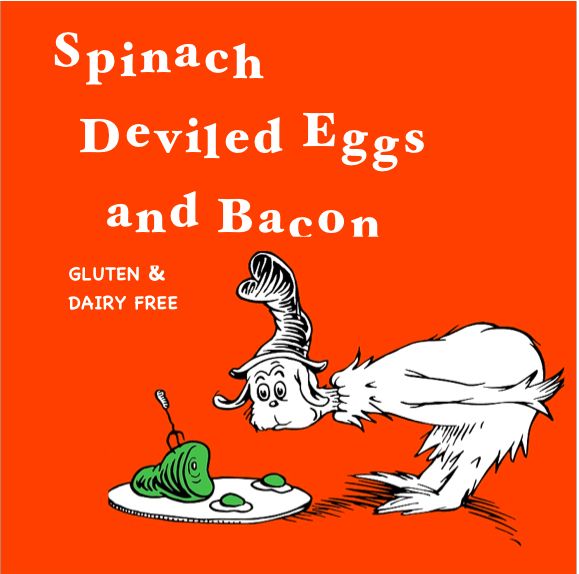 This entry was posted in Dietary Restrictions, Gluten Free, Includes Meat, Recipes, Sides & Appetizers and tagged Appetizer, Baby Shower, Bacon, Cooking, Deviled egg, Finger Fod, Gluten Free, Mayonnaise, Mustard, Spinach. Bookmark the permalink.